Laura Riley, an Associate Broker of West Wood Realty, has been in the Real Estate business for over 20 years. Laura specializes in farm and ranch sales, commercial sales and development properties. Her commitment is client satisfaction and outstanding customer service. Some of Laura’s past projects include the Union Pacific Intermodal Project in Santa Theresa, NM, mixed use developments in Las Cruces, NM, Spaceport America and the Rio Rancho City Center project that now includes Cleveland High School, Rio Rancho City Center, Santa Ana Star Center, University of New Mexico Westside Campus, UNM Sandoval Regional Medical Center, and Central NM Community College Westside Campus. 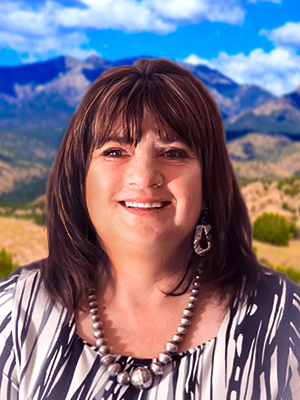 In addition, Laura has worked on real estate transactions regarding agricultural properties throughout the state, touching every corner from Eunice to Waterflow and from Clayton to Animas. She has experience in valuation of all types of real property. Laura has worked on acquisition and administration of leases, facilitated land sales and exchanges with the State of New Mexico, BLM and other governmental agencies, provided expertise in analysis and development of subdivisions from financial to sales and marketing as well as management in the agricultural holdings of the various clients. Laura grew up on a ranch in northern New Mexico and has been actively involved in agriculture her entire life. This experience offers her the knowledge and skills needed to adequately represent your properties. She currently operates a small cow calf operation in Rio Arriba County. Additionally, Laura has served on the East Torrance Soil and Water Conservation Board, the New Mexico Junior Livestock Foundation, the NM Farm and Ranch Heritage Museum Foundation, Sandoval County Farm Bureau and is a current New Mexico 4-H Foundation Board Member.